We have been amazed,and mortified, throughout the season at how poorly the Steelers execute the traditional screen pass (i.e. 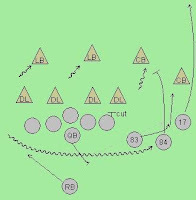 allow defensive line to penetrate, pull a guard and tackle, throw a pass to a running back). They have been somewhat more successful in running the so-called "bubble" screen to a wide out, but the screen is just not a play that Pittsburgh has run well this season. So it was with some interest that we read an older item from our friends at Football Outsiders that provides an in-depth look at a variety of screen packages (an example of which you can see above). We don't know if there is time to work any of these into Sunday's game plan, but it was worth a try.